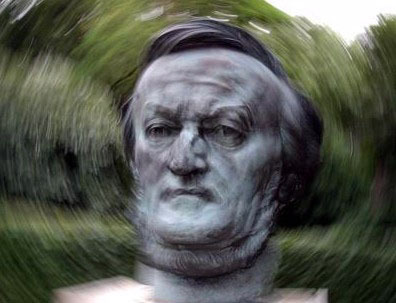 One of Israel's enduring cultural peculiarities is its ban on public performances of the music of Richard Wagner, notorious as an anti-Semitic propagandist and as Hitler's favorite composer. This past fall, the ban was the subtext of a minor political firestorm over the awarding of a national cultural prize to Israeli musician Daniel Barenboim, who once violated the ban, and the subsequent attempts by rightwing Israeli politicians to withhold it. Much of the controversy was mere political posturing, but it also brought into play layers of phenomena -- history, politics, philosophy of art, the relationship between Wagner's work and the Nazi regime, the presence of anti-Semitism not only in Wagner's philosophy but also in his music, and the degree to which the state of Israel must, by definition, bear the weight of the Holocaust in perpetuity. In late 2003, Israeli Education Minister Limor Livnat drew headlines by announcing her intention to withhold the prestigious Wolf Prize, which had been awarded jointly to conductor/pianist Daniel Barenboim and cellist Mstislav Rostropovich - unless and until Barenboim publicly apologized for having performed Wagner's music in Israel. Barenboim had been declared "persona non grata" by the Knesset in 2001 after sneaking the prelude from Tristan und Isolde as an encore into a Jerusalem performance by the visiting Berlin Staatskapelle orchestra, which he conducted. The Wolf Foundation, whose annual awards are presented in an official Knesset ceremony, had particularly cited Barenboim's "dedication to human rights causes and to world peace (which) has helped to bring together individuals of all races and creeds" in making the award, and Barenboim is well-known for his political and artistic collaboration with leading Palestinians (most notably Edward Said). Therefore, Livnat's decision may well have been motivated primarily by pure political concerns. Indeed, while her objection was framed in the context of Wagner, and was responded to on those grounds, the controversy revealed how closely issues of the Holocaust and questions of contemporary political actions vis-a-vis the Palestinians have become intertwined. Anyone with a residue of national pride should be revolted by how Barenboim thumbed his nose at the Jewish state... it's equally unsurprising that Rivlin's deputy, Muhammed Barakei [Israeli-Arab Knesset Member, Ed. ], volunteered enthusiastically to stand in (for Rivlin at the ceremony)...Like some enlightened Ramallah humanists, Wagner aspired to see all of us dead. Barenboim, interviewed on Israeli radio, seemed to break down under fire. He was saddened by the controversy and, he added, if his Wagner performance had hurt anyone, he was truly sorry. Barenboim's remarks were close enough to an apology -- Livnat hurriedly accepted his contrition, and the scandal came to an abrupt end. Barenboim will receive his prize, but Israel remains Wagner-less, at least officially. Public performances of Wagner's music in Palestine ceased the day after Kristallnacht, in 1938. The then-Palestine Philharmonic, which had debuted two years earlier performing Wagner under the baton of Toscanini, removed the overture to Der Meistersinger from its program in a protest against that tragic night in Germany, and the ban has continued ever since. (A similar ban on Wagner's music in the Soviet Union lasted for fifty years, until the collapse of the communist regime in 1989). Wagner was not alone -- Richard Strauss and Carl Orff, both Nazi-affiliated in their lifetimes, were also banned for decades. The state-run New Israeli Opera Company avoids not only Wagner operas but all operas in German, with the exception of the occasional Mozart singspiel or Viennese operetta. In the popular summer master classes held in Tel Aviv by Metropolitan Opera coach Joan Dornemann, arias in French, Italian and English are studied and performed, but almost never German. There's something about the sound of the language in itself, of German being sung, that arouses a horrified response. At the same time, Wagner remains quite prominent in Israeli cultural life. International Wagnerian symposia have been conducted at Tel Aviv University, Hebrew-language books have been written on Wagnerian subjects, music students study Wagner, TV and radio broadcast the operas. Only public performance has remained taboo. 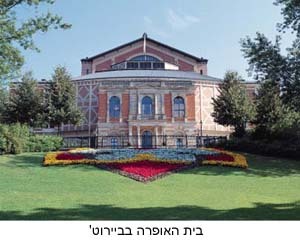 Lower image: Photo of Bayreuth, from Israeli site www.operaheb.co.il.